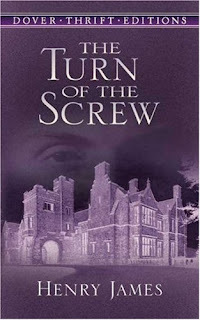 Melbooksnstuff: Henry James "The Turn of the Screw"
The Turn of the Screw is a novella by Henry James first published in 1898. This is the first work by James I have read. The shorter length allows a good introduction to the author's work without becoming too overwhelmed by his challenging style. The plot is ostensibly a rather sophisticated ghost story. I say ostensibly because the plot itself is ambiguous. If anything Henry James's The Turn of the Screw is one of the most reviewed and debated fictitious works you could think of. The story begins at a Christmas house party where tales involving the appearance of apparitions are being discussed. It is suggested that when such reports involve an apparition appearing to a child the atmosphere is heightened thus giving the effect "another turn of the screw." One of the guests at this party tells a story from a manuscript that was given to him many years earlier by its author, a governess. What unfolds is her version of events at Bly where she is put in charge of two orphaned children. The style of the story can be described as late Victorian Gothic. With that, it has the obligatory large, many roomed spooky house, stern housekeeper and pretty children. As mentioned before on this blog, I will always try to avoid spoilers because I do believe they diminish the pleasure of reading a book for the first time. For this review that is a difficult promise to keep because the story is so perplexing. 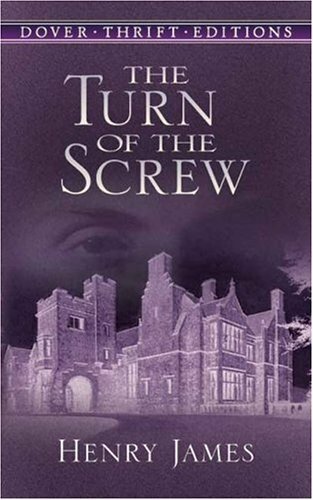 I will avoid further discussion of the plot specifically, but highly recommended, once a reader has made their own way through "The Turn of the Screw" a perusal of the many discussions available on the internet regarding the interpretation of the story. Having said that I am going to put a slight spoiler warning here. Because I think to discuss the merits of the novella further may amount to a slight spoiler for some. The ambiguous round about writing style, which is something I want to discuss, is to a purpose that does intersect with the plot. So if you want to read the story without any premonitions as to the purpose of the ambiguous style, skip the next paragraph. Henry James plays around with first person narrative. The beginning, at the Christmas gathering is told in the first person from the perspective of a guest who is hearing the story. Once the telling of the manuscript begins the first person narrative switches to the voice of the governess. Of course the first person narrative lends itself beautifully to the experience of a ghost story. James also uses it to increase the confusion and tension around what is actually happening. There are uncertainties about what we are being told. The ultimate conundrum persists long after one has finished the story. The enigma at the heart of the story, much more than the ghostly apparitions is what keeps the reader awake at night long after the story is read. It is not straight forward. I think we have become used to far more simplistic uses of first person narrative trickery in modern story telling. Henry James is a conjurer here, it is very smoke and mirrors. There is no "ta dah!" at the end. The reader has to work harder than that. "How could I put even a little of that article into a suppression of reference of what had occurred? How on the other hand, could I make reference without a new plunge into the hideous obscure? Well, a sort of answer, after a time, had come to me, and it was so far confirmed as that I was met, incontestably, by the quickened vision of what was rare in my little companion." p. 79 The Turn of the Screw. This is a reference to young Mile's exquisite table manners. For me, overall, the work is worth it. James does create a very tense atmosphere, loaded with longing, uncertainty and frustration. And yes, the frustration I think is often mirrored in the reading experience itself. There is something marvellously clever in a tale that allows distinct multiple interpretations and I suspect that this was the author's intention. We can only suspect what James's intention may have been because in his own comments on the interpretation of The Turn of the Screw, he is also deliciously ambiguous. I hesitatingly loved it. The onus is on the reader's imagination to conjure up the frightening things that lurks in the shadows. Sarah Water's 'The LIttle Stranger' is quite reminiscent of it. The horror is never named and it only peeps out now and then, with the effects on the character the only evidence it exists. On a side note, did you know there's an opera? I'm going to see it in July. Calls for a re-read, I think. I did not know there was an opera. It would be fascinating to see how they capture everything using opera. I hope you enjoy it. Thanks for your comment. I read this very recently and really loved it. It was so spooky the hairs on the back of my neck were standing on end. The language is defintiely a barrier but it worked for me. Your review is really great. I lvoed te way you talked about the first person narrative. Yes it is the figure staring intensely at the window that totally spooked me. There are references to this and other of James novels in "The Master" that provide a bit of background and context which I think you would enjoy. As ever, thanks for taking an interest in my posts Becky. I look forward to reading your review of The Turn of the Screw.